Made from a blend of polyester and washable silk, these throw pillows will bring a burst of color to any room. See color selection in 4 different pictures and drop down menu. Throw pillows have removable insert so that the covers can be dry cleaned or hand washed. Removeable case measures 14" x 14", after stuffing, finished pillow measures 14"Lx14"Wx6" thick. 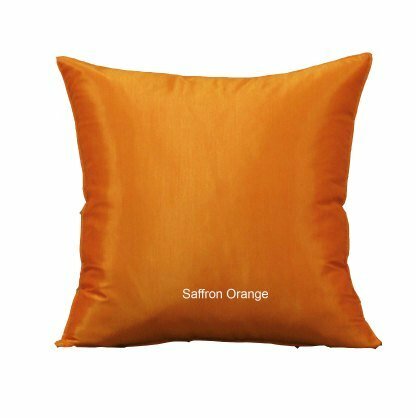 Made from blend of polyesters to resemble the look of silk, pillow measures 14" x 14" x 6" thick. Removable cover is 16"x16"
To see actual color before you buy, send us a self addressed stamped envelope requesting color swatches. If you have any questions about this product by Shopping The Globe, contact us by completing and submitting the form below. If you are looking for a specif part number, please include it with your message.